Gordhan said Eskom’s goal is to ensure there will be no load-shedding from 3rd April 2019 – but admitted there is a lot of hard work ahead for the company. An important culture change needs to happen in Eskom, including more accountability and consequence management, said Gordhan about the work ahead. 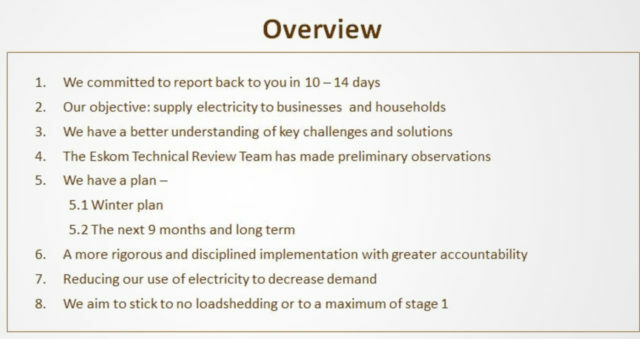 If there is load-shedding going forward, however, the aim is that it will only be stage 1 load-shedding, he said. Gordhan said that despite Eskom having a better understanding of what the organisation’s problems are, he appealed to the public and businesses to reduce their electricity usage where possible. To achieve its “no load-shedding” goals, Eskom has plans for the short-term and the long-term, said Gordhan. He also stated that a task team of engineers who have strong knowledge of power plants – and are in a good position to speak objectively to the Eskom board and its management – are analysing where there are problems and how they can be fixed. Gordhan went on to say that Eskom has a “winter plan” in place which will ensure there is enough electricity during the cold season in South Africa. Eskom considers winter to start from 1 May, and May is used to plan what must happen between June and August, he said. This includes planning for how much energy is required and how to ensure power demands are met. Gordhan stated that Eskom has further committed to meeting certain objectives it has set out for itself. - Being transparent and frank with the public. - Ensure energy security in South Africa. - Impact positively on the economy. It was added that there are no plans to privatise Eskom.